In the summer of 2017, I spent two months in Europe, visiting seven countries as I researched my book, Shapeshifters: A Cultural History. Part of that time I was in Transylvania in Romania, the home of Stoker’s Count Dracula, as well as Prince Vlad. Romanians have a mixed view of Vlad. For some, he was a national hero, a stern but capable leader who defended his lands from invasions by the Ottomans. To others, he was a ruthless murderer. To be sure, Vlad kept law and order in his domains in a ruthless manner, with impalement being his favorite form of torture and punishment. At one point, he impaled 20,000 Turkish prisoners of war along a road upon which enemy troops would advance, striking fear in them. 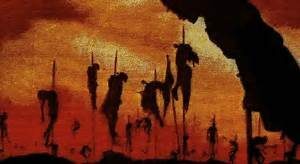 It is estimated that he executed at least 40,000 people during his reign and possibly as many as 100,000, leaving many of them on display in a forest of the impaled. 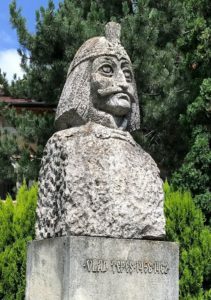 Vlad Dracul was born in 1431 in Sigishora and soon learned all the military and political arts necessary for a young prince to master. His father, also named Vlad Dracul, had made an alliance with the Turks and had accompanied the Turkish sultan, Murad II, on savage raids in Transylvania, which led to the family Dracula’s bloodthirsty reputation. When the senior Vlad Dracul died, his son became a prisoner among the Turks, where he became an officer and learned both Turkish military tactics and torture methods. In 1456, when he was barely 23-years-old, Vlad Tepes Dracula escaped the Turks, becoming the official prince of Wallachia. His reign was marked with constant warfare against the Turks, against neighboring princes, and even against the Saxon boyars of his domains. He brooked no opposition and was brutal in repressing it, giving more credence to the bloody stories about him. In addition to his executions of prisoners and criminals, there were also rumors of sadistic practices and murdering of boys and girls in rituals designed to keep him young and healthy. It is not clear how Vlad Dracula died; some say he was killed by the Turks, others by an assassin, nor is the exact date of his death known. It might have been in December 1476 or January 1477. 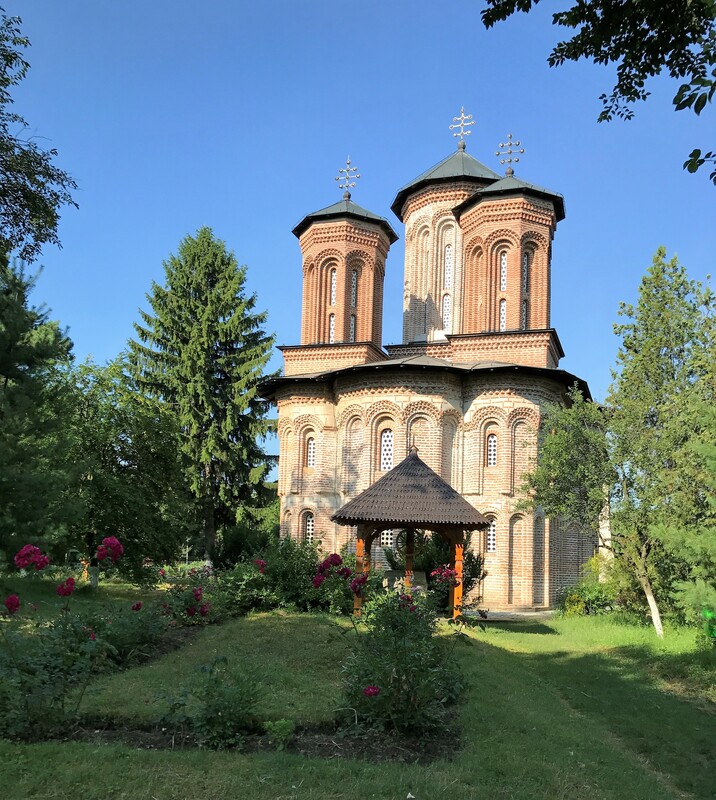 His burial place is a mystery as well, although the most likely location seems to be in the monastery on the little island in Lake Snagov, about twenty miles outside of Bucharest. The monastery on Lake Snagov where Vlad Tepes Dracul is buried. I visited the monastery on a beautiful, sunny day, walking over the long pedestrian bridge that connects the little island with the mainland. The lake is pristine, calm and peaceful, with the homes of wealthy Romanians ringing it; Nicolae Ceausescu’s vacation home still overlooks the blue waters of the lake. 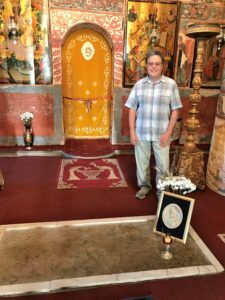 The monastery is small, really nothing more than a chapel, but it is richly decorated with icons and paintings and an elaborate, golden iconostasis. 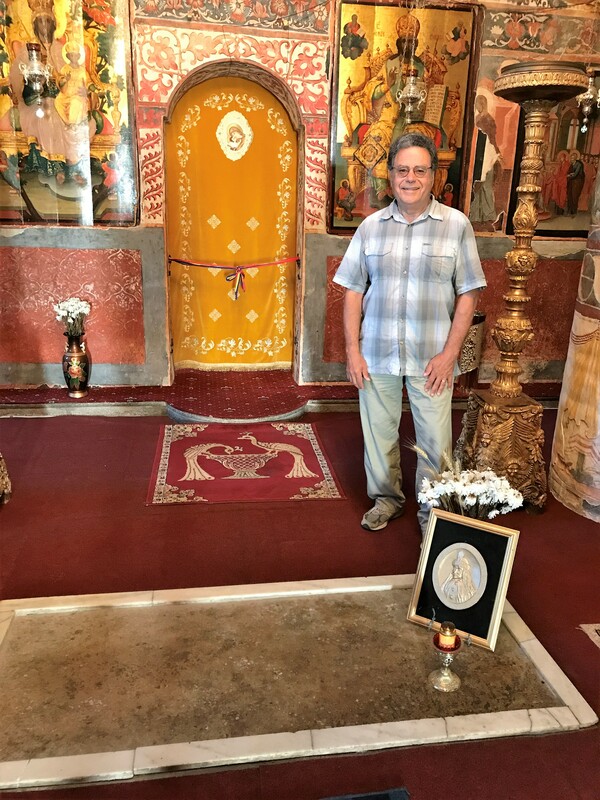 The burial place of Vlad Dracula is in the floor directly before the iconostasis and is covered with a large stone slab. A single vigil light burns upon it, placed before a portrait of Prince Vlad. I was the only person in the chapel and I knelt to touch the stone, wondering only partly in jest, whether his energy would still be palpable after so many centuries. 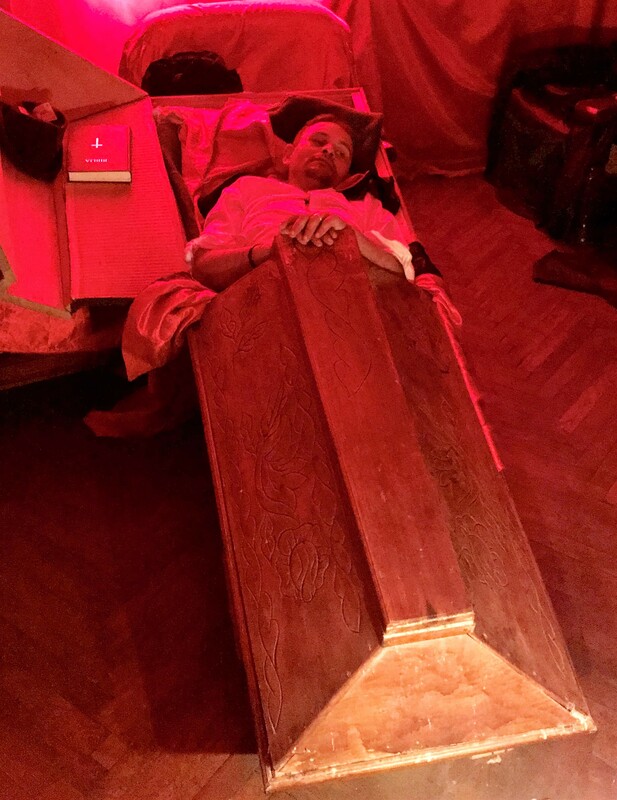 The author at Vlad Tepes Dracul’s burial site. 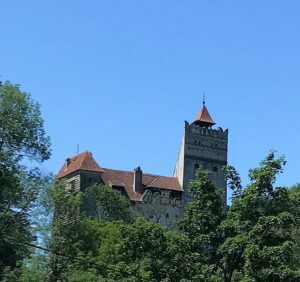 A few days later, I was in Transylvania. 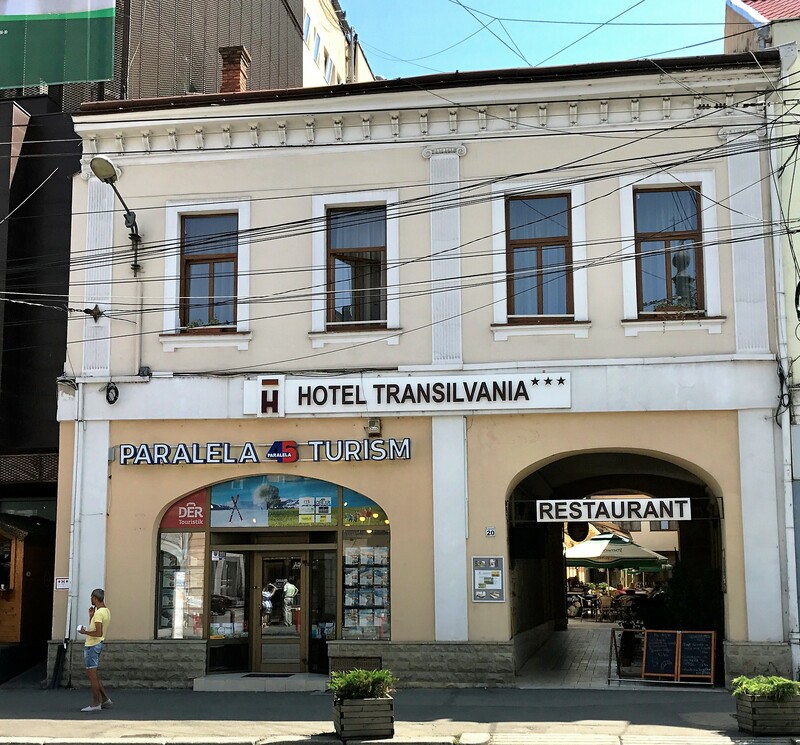 In Cluj-Napoca I stayed at Hotel Transilvania, the hotel where, according to Stoker’s novel, the fictional Jonathan Harker stayed as he made his way to visit Count Dracula. In the novel, the hotel is named the Continental but all the references and directions clearly point to Hotel Transilvania being Stoker’s model for his Continental Hotel. In the novel, Harker orders chicken paprika for his lunch at the hotel; today the hotel serves “Johnathan Harker chicken paprika.” The updated hotel is small, with rooms arranged around a central courtyard and the manager told me that he is in the process of creating a Jonathan Harker suite that will be outfitted in Victorian-era furnishings and Dracula memorabilia. In Sigishora, a UNESCO World Heritage City, I visited the house where Vlad was supposed to have been born. 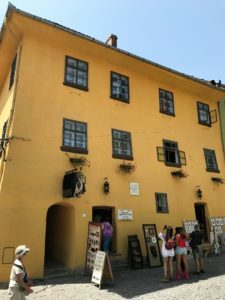 It is now the Casa Dracula restaurant and is loaded with Dracula kitsch; dinner plates are emblazoned with a dragon—dracul means “dragon” in Romanian—you can buy a bottle of Dracula merlot wine, there are miniature busts of Vlad everywhere, along with portraits hung on the walls. But the piece de resistance is the upstairs room, drenched in red light, where the young Dracula was born. It took my eyes a few moments to adjust from the darkness into the red glare but when they did, I found myself in a room that was the worst spook house ever. An open coffin lay on the floor with a guy wearing fangs lying in it. He sat up and moaned, half-heartedly, I thought, when I entered the room. I told him to go back to sleep and went back downstairs. 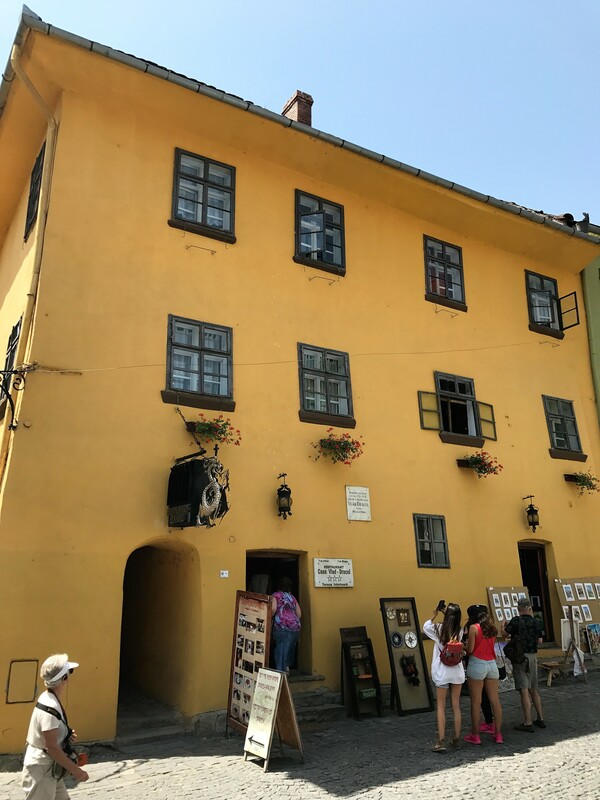 The little walled city is historically interesting, with many of its 14th and 15th century buildings still intact, but also catered to the tourists, many of them American, with all kinds of Dracula swag for sale. I found the same emphasis on marketing Dracula at Bran, where I had to walk through an entire bazaar to get to the ticket booth where I could purchase tickets to enter Bran castle. Stoker saw pictures of the castle in the British Museum and used them as the model for Count Dracula’s castle although, Prince Vlad didn’t use the castle. 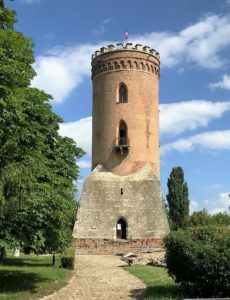 My last stop was Targoviste, the capital built by the senior Vlad Dracul and later used by his son. The ruins of the palace can be visited and the Chindi Tower, the watchtower from which Vlad “the Impaler” Dracula watched his victims suffering in the courtyard below, is still intact. Bram Stoker took a lot of liberties in his novel, but that’s what writers do, and by doing so he created a vampire that has become the model against which all other vampire books and movies are compared. In my Shapeshifters: A Cultural History, I discuss the differences between Stoker’s Count Dracula and the traditional vampires of folklore. I hope you’ll read it. Interesting! Can’t wait to read your book. What a fascinating post. I look forward to reading Shapeshifters. Thank you! I’ll certainly let you know when it’s in print!